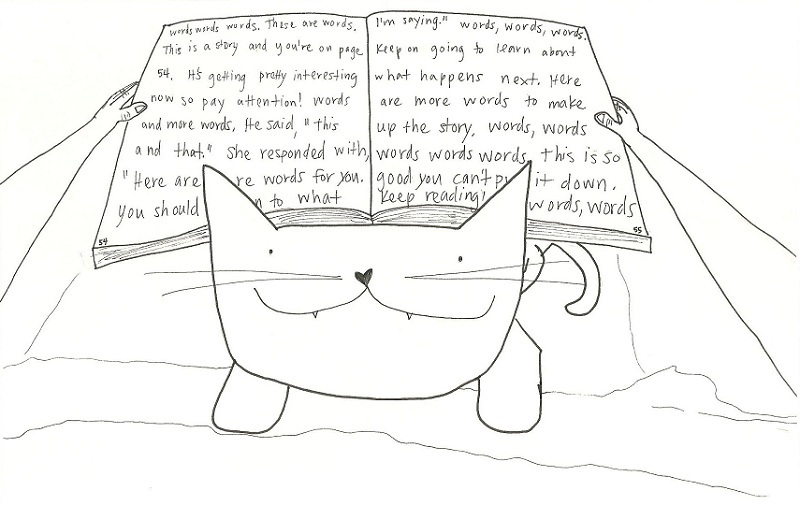 Cats must really like reading because this happens EVERY time. Warning: run on sentence alert! Imagine the scene…an evening like any other where you snuggle into bed, after brushing your teeth and taking out your contacts, of course. You set your 3 alarms for the morning since you are lazy and grab that library book that’s there next to your eye mask and headlamp. Only you wish you had a headlamp for reading in bed and it’s actually just a cheap bonus reading light that came with that zebra print Snuggie you got for your birthday from your bff (which is still great by the way!). The reading light, though a nice surprise bonus gift, actually only illuminates a spot about 2 inches in diameter and you have to manipulate it every 3 paragraphs in order to be able to read. You let your mind wander about how great it would be to have total hands freedom to hold BOTH sides of the book so the pages don’t start to turn on their own (if you’re at the beginning or the end of the book) and you don’t just have to wait until you are in the middle of the book so that the pages actually stay put while, like and idiot, you are trying to arrange the book and the reading light all at the same time. Note: trying to balance the light on your chest does not work either. Haven’t yet tried making a MacGyver style sweatband + duct tape + reading light contraption…but you know I will now that I’ve thought about it. Now, add to the mix the jingle of a collar. A soft thump crunch crunch on your bed as a cat jumps onto the awesome down comforter that your husband says is too hot so only you sleep under it and he has his own lightweight blanket (more for me, sucka!). You don’t want to invite the cat over so you use the book as shield, both visually as well as physically, attempting to avoid eye contact and eventually gently but forcefully rebounding the cat as he walks closer. This cat is persistent and does not comply. Eventually you stop fighting because his head butts are starting to make you lose your place and you just read the same conversation like 5 times. Now it doesn’t matter because an eclipse has occurred and all you see is smooth black fur (No more dandruff! Woo! more on that in the Disasterbetes2010 saga posts….soon…). You wait thinking that if you give him 10 seconds he’ll find a comfortable seat and make his move. Instead you try to “help him lay down” by petting him with some gusto and his little legs have apparently lost their joints because he’s standing strong despite the downward force. So now you make the bold move of putting your book back in front of the cat. So you lose and the cat continues until you break down and you are stuck with a cat laying on your arms and you have to try to manage holding the book, moving the reading light, not upsetting the cat, and turning pages. Thanks, Duncan. Thank a lot. This post contains false pretenses, drugs, and cats. Coincidence? Or is Adam in cahoots with a logic puzzle book? And if so, I’d like to see some royalties, please. If Duncan was a dog, Cesar Milan would say that he just owned you…you need to lay down the law! Maybe he’s actually a literary snob and just doesn’t like what you are reading? This made me lol in math class! This is what my cat does when I attempt to do homework, she sits on my book/laptop/anything school related and won’t budge.